Make this stunning water lily floral arrangement in minutes for your table or to add a bit of greenery to your home's decor. Perfect for condos or homes that are tight on space where it might not be possible to fit a water garden you can easily create a mini water garden for your home that will remind you of time spent canoeing at the cottage on a lake filled with blooming water lilies. To begin you will either need to start a water lily from a seed by soaking seeds in water and waiting for them to sprout which can take 1-3 weeks, or buy a small water lily plant from a gardening store. Water lily seeds are much cheaper and often costs $1 a seed while small plants will cost between $7-15. If you are using a purchased water lily plant remove an plastic or packaging on the plant so that you are left with just the plant and roots. Thoroughly clean out the tall glass vase and make sure to remove all soap as excess soap in the container will kill your plant. 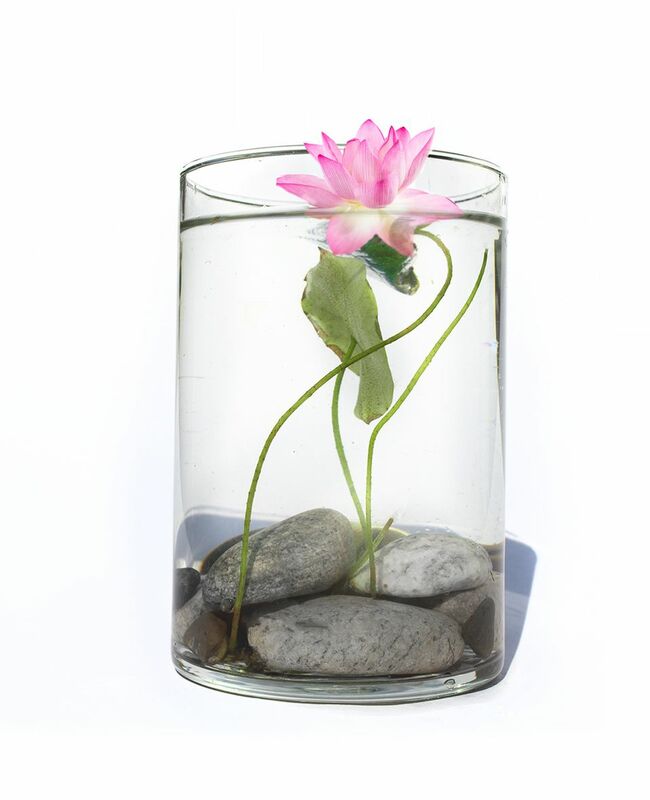 Place the roots of the water lily plant at the bottom of the glass vase in the middle. Take the river rocks and position to cover the water lily's roots. For full coverage of the roots begin by placing 4 to 5 larger rocks on all sides. Use the small rocks to fill any small gaps where the roots are still visible. It is important to be careful when placing the rocks, especially the larger ones as they can damage the delicate plant stem if dropped directly on them. As such it is suggested to use one hand to hold the plant stems to protect them and another to place the rocks at the bottom of the vase. Once the rocks are placed you are ready to fill the vase with water. Make sure to regularly monitor your water lily floral arrangement and add more water as necessary. As your water lily plant grows it will create new small plants which you will need to cut off using scissors otherwise your water lily will become too cramped in the vase. The new plants can also be planted in other glass vases to create new water lily floral arrangements that you can give to family or friends.